Product prices and availability are accurate as of 2019-04-25 01:16:46 UTC and are subject to change. Any price and availability information displayed on http://www.amazon.com/ at the time of purchase will apply to the purchase of this product. Velcro on exterior for attaching ID patches. Adjustable shoulder straps with perforated mesh. 3 removeable, closed top or open top. Allows to carry 6 magazines. Adjustable height using the removable velcro straps. Integrates with YAKEDA bags, packs, and duffel. Is a fully adjustable system for adults, S-XXL: the maximum waist is 55 inches . 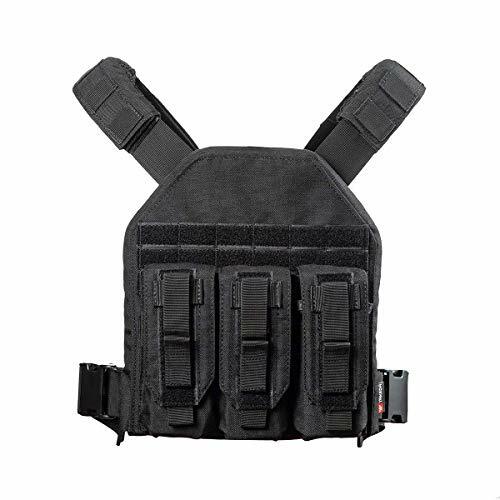 1000D nylon fabric excellent wear resistance, strength, light weight, waterproof;Packing size: 13.8 * 9.8 * 2.4inch / 35 * 25 * 6cm ,Weight: 2.1lb / 0.96kg 3 adjustable height using the removable velcro straps, closed top or open top magazines. 3D mesh added comfort and dispersal of body heat. With the use of pull straps and UTX buckles/clips, can be easily adjusted to suit the needs of the operator.